"A delicious Indian sweet, commonly gifted during celebrations like Diwali. 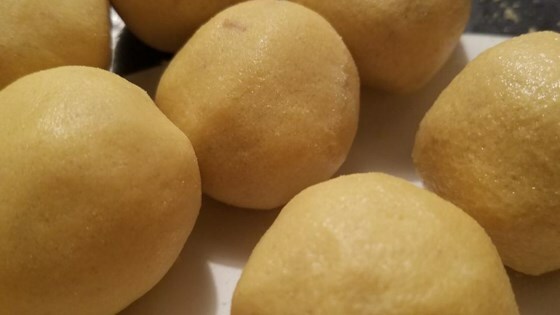 I got this recipe from my neighbor when I lived in India. She always brought me sweets that she made herself." Stir the chickpea flour and clarified butter together in a saucepan over medium-low heat until the mixture smells toasty, about 10 minutes. Set aside until cool enough to handle. Stir in the sugar, pistachios, and cashews until evenly mixed. Form the mixture into small balls the size of large cherries. Use some pressure when forming the balls so they don't come apart. Very easy to make! Great taste! Thanks for the recipe! Make sure to use the coarser grade of chickpea flour for an authentic texture. Also, I omitted the nuts due to allergies, and added 1 TBSP ground cardamom for flavor. This is delicious! Not quite the ball shaped because I didn't read the helpful hints beforehand, however, I am super excited about the taste and the experience!